Last fall we whizzed through the northern edge of Davenport, Washington, the county seat of Lincoln County since 1896 (though only after more than a decade of squabbling about it). I need to go back for a better look at this isolated wheat country town. And I need to find out more about grape nip. The 1950 edition of the WPA guide The New Washington: a Guide to the Evergreen State says of Davenport that it “is now a trade and shopping center for the Cedar Canyon mining district and has several huge grain elevators, mills, and a soda water factory.” Paula Becker’s HistoryLink article on Davenport tells the story of the Pioneer Soda Bottling Works, which was founded in 1904 and continued as a family enterprise until 1982. The company produced more than two dozen flavors of beverages, including raspberry and loganberry and pineapple soda, lemon sour, creme beer, chocolate fiz and lemon fiz and kola fiz, ginger ale, and cherry nip and grape nip. Oh, and Howdy’s orange soda. I’d especially like to know more about those nips. 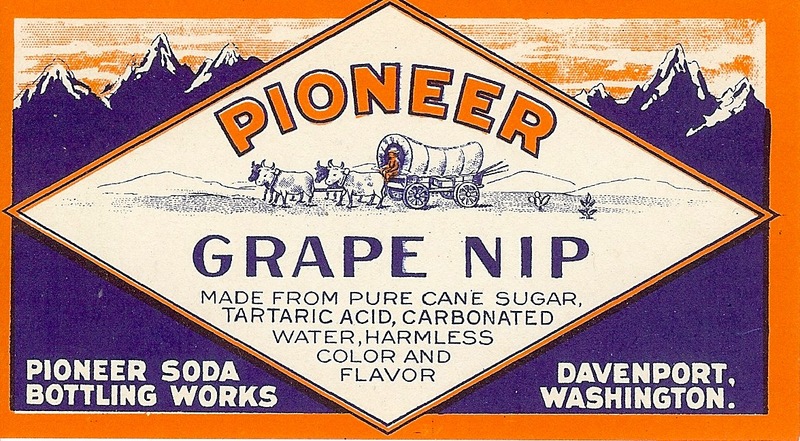 The grape nip ingredient list fails to specify grape juice, but says only that it contains “harmless color and flavor.” In that there is a suggestion that grape nip may not be a suitable base for home wine making. Rats. I’ll have to have a bottle of creme beer instead.